Phoenix, Arizona is really a neat little city. Scratch that, it’s one of the biggest cities in the entire country, one with a professional franchise in each of the four major sports. The Arizona Diamondbacks, the city’s baseball team, has been in the news quite a bit the past few weeks. When the Diamondbacks offered free-agent starter Johnny Cueto a six-year, $120 million contract, most baseball people smiled bemusedly. How cute of those precious little snakes. They actually think they can sign a pitcher of Cueto’s caliber. Cueto, of course, turned Arizona down. Twenty million dollars per year is hardly worthy of a World Series hero, no matter how sketchy his elbow might be. Phoenix has the great misfortune of existing in a literal desert. Most of us forget about the city when recollecting America’s greatest, biggest cities. Here is a list of Major League cities that are actually bigger than Phoenix — New York, Toronto, Los Angeles, Chicago, Houston, and Philadelphia. Phoenix is growing rapidly. Of the largest cities in the country, only Houston and San Antonio are growing at a similar rate. In 1990, the population of Philadelphia, the fifth-most populous city in America was 1,585,567. Today, only 1,560,297 fine people call the City of Brotherly Love home. Fifteen years ago, the population of Phoenix was 983,403. Today, that figure is all the way up to 1,537,058, and continuing to grow at a six percent annual rate. 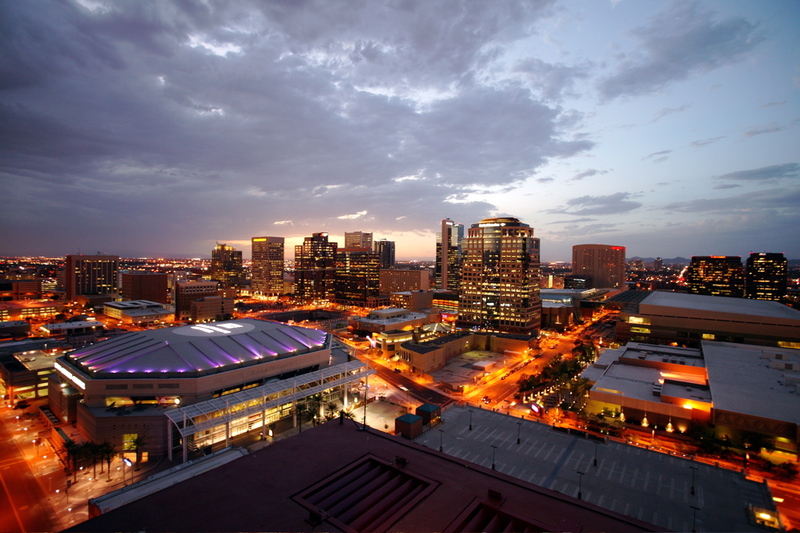 Within the next five years, Phoenix will be the fifth-largest city in the U.S. of A. The Arizona Diamondbacks started playing baseball back in 1998 and roared onto the scene with a 67-95 record. Buck Showalter was their manager, and he turned a bunch of expansion draft players into a club that won 100 games in 1999. Really, it was quite remarkable stuff. Showalter clashed with management, and Bob Brenly was able to take the team Showalter had helped mold to a World Series championship in 2001. The Diamondbacks became the fastest expansion team to win a World Series. None of that was sustainable, however, as the Diamondbacks lost Randy Johnson to the New York Yankees and Curt Schilling to the Boston Red Sox. Whatever medicinal means that allowed Luis Gonzalez to hit 57 home runs did not apply to the rest of the team, and the farm system was quite underdeveloped. It does, after all, take years of building, drafting, and strategizing to develop a comprehensive approach to creating a constant stream of All-Star-caliber talent. Since their title in 2001, the Diamondbacks have only been back to the playoffs three times. The team lost 111 games in Randy Johnson’s final year wearing purple and has been lucky, for the most part, to crack 81 wins since. Attendance, which peaked at 3.2 million in 2002, has steadily declined and now barely tops two million annually. The Diamondbacks, despite playing in one of the biggest cities in the country, routinely fall in the bottom ten in the league when it comes to passing bodies through the turnstiles. There are many reasons the Diamondbacks have a hard time getting folks out to the park. For starters, the team does not have much history. The Yankees can weather a few bad years because they have over 100 years of history and 27 titles. The Diamondbacks have none of that history to curry favor with fans during down years. A larger hurdle to overcome, perhaps, is the fact that most of the people moving down to Phoenix are from somewhere else. They’ve got their own baseball teams from a previous life lived in another city. There is no allegiance to the Diamondbacks. The franchise has been around for less than 20 seasons. Only one generation of baseball fans has grown up with the Diamondbacks playing baseball in every year of their life. That’s all quite a bit for a fledgling franchise to overcome. The payroll was low, but the Diamondbacks have some real All-Stars on offense. It took long enough to get the scouting and drafting thing down pat, and it’s now brought them Paul Goldschmidt, A.J. Pollock, Yasmany Tomas, David Peralta, and Ender Inciarte. The middle infield duo of Chris Owings and Nick Ahmed could turn out to be pretty good in a few years. If you’re not a serious baseball fan, the only player just mentioned who you may be reasonably familiar with is Goldschmidt. If the hitting prowess of the Arizona Diamondbacks escapes you, allow me to assure you, this is a very good young lineup. The Diamondbacks finished second in the National League with 720 runs, and would have ranked seventh in the American League (not bad considering Arizona plays most of its games with a number-nine hitter who may have a hard time batting over .300 in high school). So, the Diamondbacks have a ton of great young hitters. They do not have a ton of great young pitchers. They have a few pitchers who might one day turn out to be not terrible in Patrick Corbin, Robbie Ray, and Archie Bradley. Beyond those three, not much to write home about. This is not a story unlike that of the Toronto Blue Jays, another massive-market team that is often forced to deal with small-market attendance. The Blue Jays were tearing the cover off the ball at an historic pace leading up to the trade deadline, but were not in line to make the playoffs. Their pitching was awful. So what did they do? Oh, just went out and got the best pitcher on the market in David Price while also managing to upgrade their bullpen significantly (Troy Tulowitzki and Ben Revere were nice, but Price was the real reason for the turnaround). The Blue Jays snapped their long playoff drought, and then ushered Price out the door to Boston. Superhero GM Alex Anthopoulos is also gone, preferring not to work under new president Mark Shapiro. The former Cleveland Indians executive has instantly transformed the Blue Jays back from a wheeling-and-dealing big-market club to a value-oriented small-market club. Not sure how the 50,000 baseball-crazy Canadians (previously unaware that they were baseball-crazy Canadians) who routinely packed Rogers Centre after the trades will feel about all that. It’s rather difficult to sell $62 million spent on Marco Estrada and J.A. Happ as anything but being cheap, when that same sum could have bought two years of Price. Worse still, Price actually seemed to want to remain in Toronto. Down in Arizona, the Diamondbacks are doing a little thing I like to refer to as “Reverse Blue Jaysing.” The front office realizes the team is only a pitcher or two away from taking the National League by storm. So what did they do? Just went out and got the only free-agent starter coming off a sub-2.00 ERA. Now the Diamondbacks have their sights set on Mike Leake, who went to college at Arizona State. The team has also been tied to elite closer Aroldis Chapman. Ken Giles of the Philadelphia Phillies may also be considered. Like the Blue Jays, the Diamondbacks have been a big-market franchise lying in the weeds, waiting to pounce. This offseason was their chance. The offense proved its worth, and Ken Kendrick, owner/baseball nut/T-206 Honus Wagner holder, was ready to begin putting all those regional sports network greenbacks to work. Going forward, it will be impossible to view the Arizona Diamondbacks as a small-market team. The people of Phoenix have already proven that the “if you build it they will come” approach works. It worked in Toronto this season, and it will work in the desert going forward. This offseason could be the start of something special for the Arizona Diamondbacks franchise. The TV deal is much larger in scale when you factor in that the population of the Metro area is over 4 million people. Being local, Phoenix can easily be overlooked in comparison to a few suburbs.